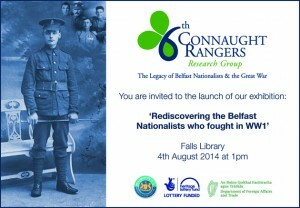 Home / Posts Tagged "Margaret Ward"
The 6th Connaught Rangers Research Group Exhibition ‘Rediscovering the Belfast Nationalists who fought in WW1’ will take place as part of Féile An Phobail from Monday 4th August to Friday 8th August 2014 at the Falls Library (normal library opening hours). The exhibition launches on Monday 4th August at 1pm. Monday 4 August at 7pm: Remembering, Forgetting and Commemorating Ireland’s Great War: Issues for Belfast, with Professor Richard Grayson, Goldsmiths College. Tuesday 5 August at 1pm: The Soul of the Nation: Irish republicans, war and rebellion, with Fearghal McGarry, QUB. Wednesday 6 August at 1pm: The Great War and Unionist Memory, with Philip Orr. Thursday 7 August at 1pm: Belfast Women and the Great War with Margaret Ward and Lynda Walker. Friday 7 August at 1pm: The formation and history of the three Irish Divisions, with Jimmy McDermott.